The spa gardens in Bad Kötzting and the city centre get connected. For this purpose there has to be installed a barrier-free access to bridge traffic areas and train tracks. The bridge starts on the side of the old city centre with a newly built ramp. The ramp is the northern abutment of the filigree, 3 m wide steel bridge. 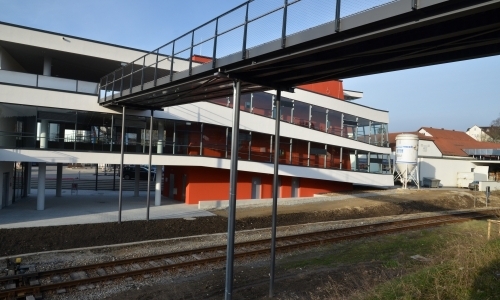 The span to the newly built prevention centre is 45 m.
The passageway leads through the building and further to a second 25m long bridge which spans over the train tracks and connects the spa gardens with the city. The rampart in the spa gardens serves as the southern abutment of the bridge. It is approx. 180 m long and 8 m high. It is accessible, serves as noise barrier and crossroad. The basic construction of the rampart is a cantilever retaining wall of reinforced concrete.